As if we didn’t already have plenty of reasons not to eat fast food people like this guy serve as a great reminder. However, if you are in the mood for pizza, you have been warned. A clip of a guy named Jaylon Kerley has been going viral in recent times. In this video, you can see him spitting on the pizzas before preparing them while at work at Comerica Park in Detroit. Since this video gained a lot of attention he has been fired and arrested, rightfully so. Tampering with food in this manner is not something anyone should get away with. He was arrested on charges of food law violations and for those who do not know this is a felony. He could end up serving up to 4 years in prison depending on how things play out. 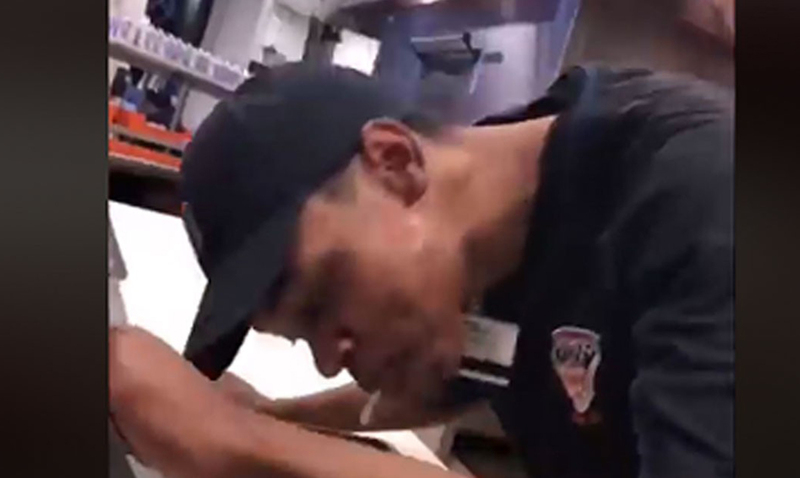 The footage of him spitting in food was taken by another employee (Quinnel May) who claims Kerley was spitting in the food because he was angry that the supervisor had been yelling at him. Business Insider says that while May tried to report the incident to his management, he was ordered to leave the stadium and threatened with prosecution if he didn’t remove the post from Instagram showing Kerley spitting on the pizza. May was not fired but has been suspended and the company that runs the place making these pizzas has released a statement claiming that no one acting in official work capacity had asked May to remove the video. You can check out the full video below. What do you think about this situation? How should things like this be handled? This kind of thing is serious and the judge at Kerley’s arraignment earlier this week even went so far as to say there should be mandatory testing done on him for infectious diseases. How would you feel if you found out someone spit in your food?